What a day for the Nationals! The Nationals are still undefeated to start the 2012 season after beating the Cubs 7-4 today. A lot of the credit for the win goes to the Shark. Or at least that's what appears to be the case. I was getting my highlights from Tyler via text message because I was in The Big Apple (where so many humans have smart phones, you can't check box scores...first world problem)! The Shark was clutch today, going 2 for 4 with a single and a big RBI double to strengthen the Nats lead (I know Tyler watched the game so maybe I can convince him to add better insight to the game recap). 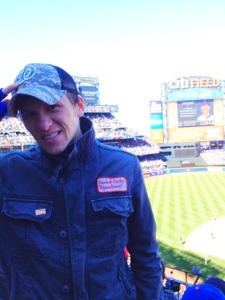 While I was in NYC, I had the opportunity to take in a New York Mets game. I gotta say, Citi Field is a pretty nice park. Possibly because it is only a couple of years old, and the season is only two games in, but the park was new/clean and very nice. The weather was great and the Mets were playing the Braves so I was able reminisce about Nats games past, when Livan Hernandez took to the mound with his 40 mph heater. The Mets won 4-2 and I would occasionally find myself cheering for the napkins that would find themselves blown onto the field. I tried to spread the Shark nickname, but literally no one seemed to care about the Nationals treasure, and Most Fearsome Outfielder. Sad.